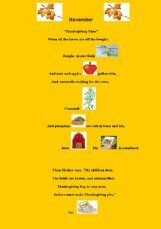 Rebus about Thanksgiving. It was taken from internet and adapted to check reading comprehension. It was made by Diana Contreras to her students. 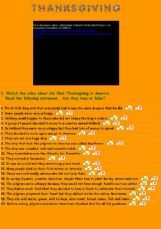 Story of the first Thanksgiving in America, True or False questions about the video and 2 exercises about Thanksgiving vocabulary. Have a nice week! 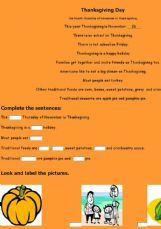 Ever heard about Thanksgiving ? 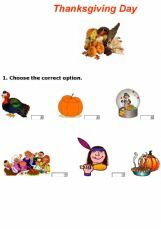 A Yahoo News video document for students to practise listening comprehension and check what they know about Thanksgiving. This ws is for two of my special students. It is really easy but they need these kind of work. Enjoy. A very easy worksheet for my special students. Have fun. A great online activity for kids in intermediate or pre-intermediate levels. 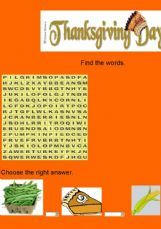 It contains a short, funny clip about the story of thanksgiving, a true or false exercise and a special crossword. Enjoy it!